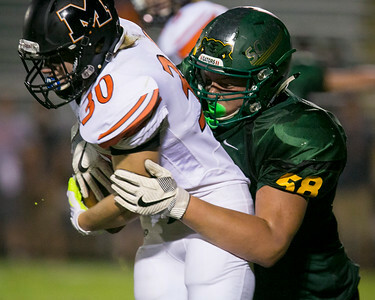 Daryl Quitalig - For Shaw Media Crystal Lake South defensive lineman Trevor Keegan (58) tackles McHenry running back Michael McManus (30) during the game at Crystal Lake South High School on Friday, Aug. 26, 2016. The Warriors won, 45-31. 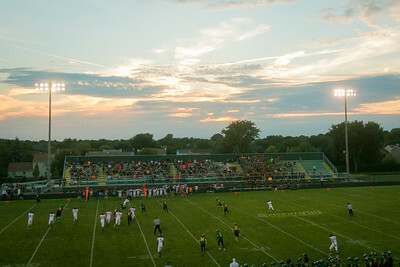 Daryl Quitalig - For Shaw Media The sun sets behind clouds and behind the west-side bleachers as McHenry runs an offensive play during the game at Crystal Lake South High School on Friday, Aug. 26, 2016. After a legal battle about the height of the bleachers, they currently stand shorter than last season. 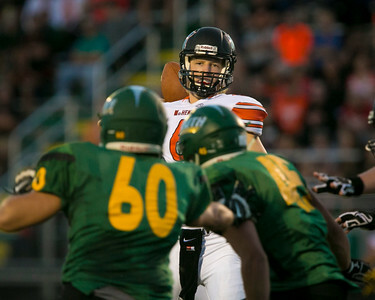 Daryl Quitalig - For Shaw Media McHenry quarterback Colton Klein (6) passes the ball during the game at Crystal Lake South High School on Friday, Aug. 26, 2016. The Warriors won, 45-31. Daryl Quitalig - For Shaw Media McHenry free safety Kennedy Kosmalski (31) secures an interception thrown during the game at Crystal Lake South High School on Friday, Aug. 26, 2016. The Warriors won, 45-31. 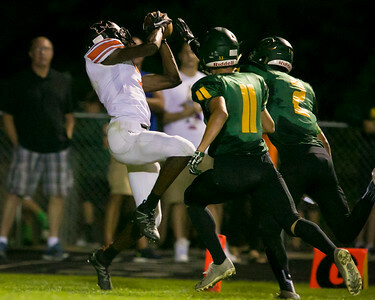 Daryl Quitalig - For Shaw Media McHenry wide receiver Matthew Mohr (5) secures a touchdown-scoring catch past two Crystal Lake South defenders during the game at Crystal Lake South High School on Friday, Aug. 26, 2016. The Warriors won, 45-31. 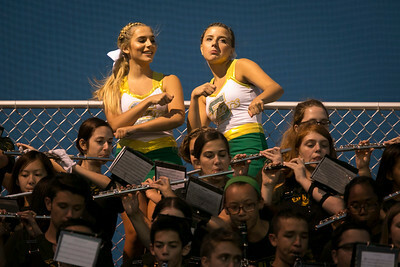 Daryl Quitalig - For Shaw Media Crystal Lake South pompom squad members Victoria Falato (left), 16, and Katie Gorski, 17, dance along as the marching band plays "All of the Lights" during the game at Crystal Lake South High School on Friday, Aug. 26, 2016. The Warriors won, 45-31. 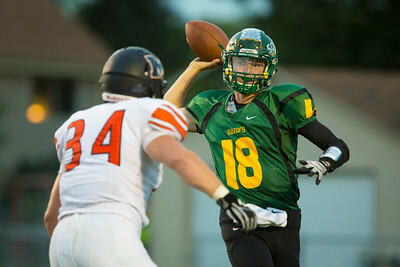 Daryl Quitalig - For Shaw Media Crystal Lake South quarterback Luke Nolan (18) passes the ball during the game at Crystal Lake South High School on Friday, Aug. 26, 2016. The Warriors won, 45-31. 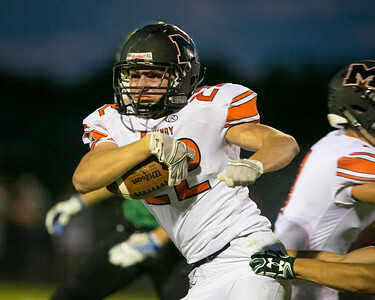 Daryl Quitalig - For Shaw Media McHenry running back Giovanni Purpura (22) runs the ball during the game at Crystal Lake South High School on Friday, Aug. 26, 2016. The Warriors won, 45-31. 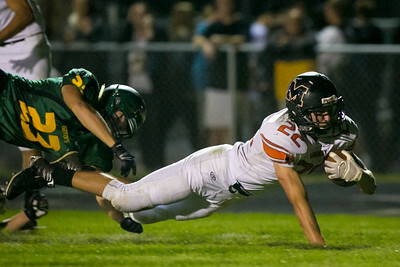 Daryl Quitalig - For Shaw Media McHenry running back Giovanni Purpura (22) scores a touchdown during the game at Crystal Lake South High School on Friday, Aug. 26, 2016. The Warriors won, 45-31. 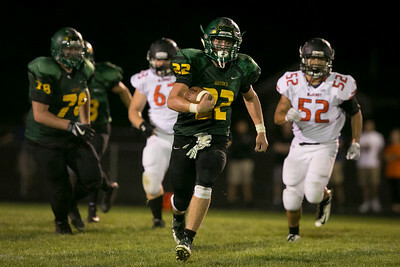 Daryl Quitalig - For Shaw Media Crystal Lake South running back Michael Swiatly (22) runs the ball for a touchdown during the game at Crystal Lake South High School on Friday, Aug. 26, 2016. The Warriors won, 45-31. 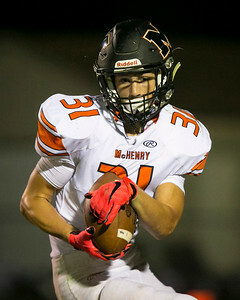 McHenry quarterback Colton Klein (6) passes the ball during the game at Crystal Lake South High School on Friday, Aug. 26, 2016. The Warriors won, 45-31.